With all the news about recalled dog foods and dog treats lately I have been thinking about making treats for the dogs, but I’ve never gotten around to actually doing it. Visit the American Veterinary Medical Association to find out about US FDA and manufacturer animal food recalls and alerts or follow them on Twitter @AVMARecallWatch. Recently, my Miniature Schnauzer began having allergy issues to the point that he scratched and bit himself raw. After months of vet visits and steroids to no avail, I finally had him allergy tested. Turns out he is allergic to beef, wheat, and milk. A dog allergic to beef??!! I thought I was doing good feeding him a grain free food of beef meal but I was only aggravating his allergy. I’m glad I finally had him allergy tested! So, at that point I was on a quest to make some inexpensive, dog treats that weren’t full of things that I couldn’t pronounce and he couldn’t eat or at risk of being recalled. I have no idea how to make dog treats, but what I do know is baking!! Figuring that I would approach it like I was making cookies but without all the good stuff (like chocolate chips), I started mixing and adding and baking until I came up with something that resembled a recipe! This was a test run recipe but it turned out so well I wanted to go ahead a share it. 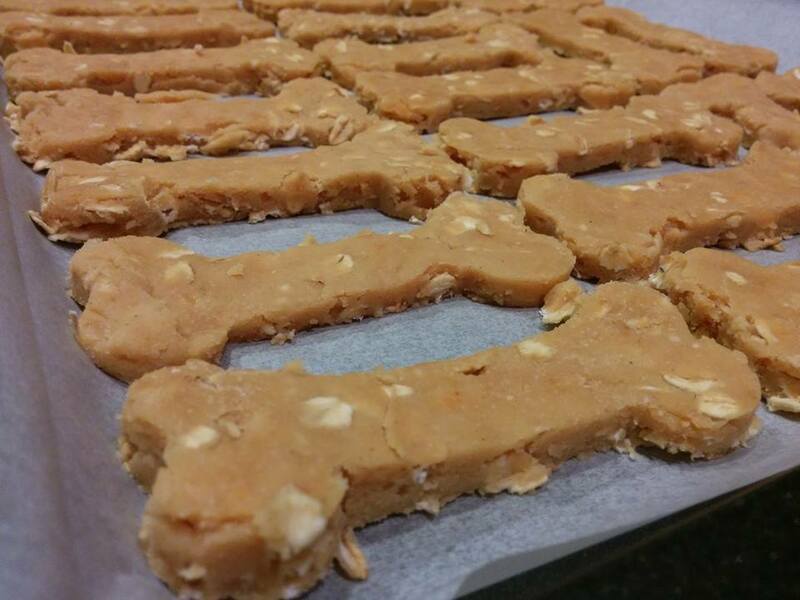 As I tweak the recipe I will post updates and please feel free to share your recipes for dog treats! I know Cosmo and Echo won’t have any problem taste testing!! Preheat oven to 350 degrees (325 if you are using a dark coated, non stick pan). Line a baking sheet with parchment paper. Mix all the dry ingredients in a bowl. Mix wet ingredients together in another bowl. Place dry mix into the bowl of wet ingredients and mix until dough forms. If it’s too dry, add a little more chicken broth or some water. Or add a little more flour if the dough is too sticky or wet. Place dough on wax paper and roll out. I rolled the dough to about 1/4 of an inch thick. Cut out the dough with cookie cutters or use a pizza cutter to cut strips or squares. Place the cut out dough on the parchment lined cookie sheet and baked about 15-16 minutes. Let cool completely before giving them to your pet. Store in a air tight container. These are not crunchy like the dog treats you buy in the store but I think that may be due to the soy and coconut flours. **Please remember to ask your vet if you are unsure about what is safe for your pet to eat! Oh my goodness! This cake was so good! The whole family loved it. Wes said it was the best Birthday Cake he’s had all year. I told him that was not a compliment, but he insists it was. Whatever, it was pretty darn good and when the 11 year old and 14 year tell you how good it is and nearly lick the plate clean then you know it’s good! Too bad I didn’t take a photo before they (ok, we) tore into! Preheat oven to 350 degrees F. Grease and flour three 8-inch round baking pans. Or two 9-inch round baking pans. In a separate bowl, whisk together the remaining dry ingredients (flour, cinnamon, baking soda, salt, baking powder, nutmeg and cloves) until combined. Add the dry ingredient mixture to the mixing bowl, and beat on medium-speed until just combined, scraping down the pan at least once to be sure that everything is well mixed. Then fold in the grated carrots by hand, and stir until combined. Pour the batter evenly into the prepared cake pans. Then bake for 25-30 minutes or until a toothpick inserted in the middle of the cakes comes out clean. Remove pans and let them cool on a wire rack until the cakes reach room temperature. Then remove them and use a large knife to level off the tops of the cakes so they are level and even. Layer the cakes with the cream cheese frosting, and then frost the outside of the cake as you desire. Serve that day or store, covered, for up to 4 days. Using an electric mixer, cream together cream cheese and butter on medium speed for 1 minute or until smooth with no lumps remaining. Add in vanilla extract and salt, and continue mixing until combined. Lower speed to medium-low and gradually add in powdered sugar. Increase speed to medium-high and beat until combined. If frosting is too thick, you can add in a teaspoon or two of water. If it is too thin, you can add in more powdered sugar. Quick and tasty fudge like Grandma used to make. I made this fudge today after coming across Lori’s blog, A Pinch of Glitter. I love this fudge and it reminds me of being a kid. Since I had all the ingredients on hand I decided to whip up a batch and step back in time to a much more simple era. In the few minutes I enjoyed a few pieces of this fudge I forgot about being an adult and reverted to a little girl old who’s only worry was where her cowgirl boots and red cowgirl hat were! This fudge is a wonderful smooth chocolate flavor without being too sweet or dry and it’s just so easy to make! Thanks, Lori, for taking me back to a moment when things were a little more sweet and easy! These are simply wonderful. You can even melt a Rolo candy on top with a nut on it or use any type of Hershey Kiss candy! What’s better than eating a peanut butter cup? Making them yourself!! This recipe is so easy the kids made them with very little help from me. Seriously, all I did was set out the ingredients and clean up when they were finished. I found this recipe on Hoosier Homemade. It looked simple and yummy. I love peanut butter and chocolate and I can’t wait to eat one. Right now they’re in the fridge and I can hear them calling me! I did eat a little bit of the peanut butter mixture that was left over, it was so good! Perfect peanut butter taste with just the right amount of sweetness. Fill mini muffin tins with mini paper liners. I just lined the muffin liners up on a baking sheet and it worked fine. In a small bowl, combine 1/2 cup peanut butter, butter and confectioners sugar and salt until smooth, set aside. In a microwave safe bowl, melt the chocolate chips, candy bars and remaining peanut butter, stir until smooth. 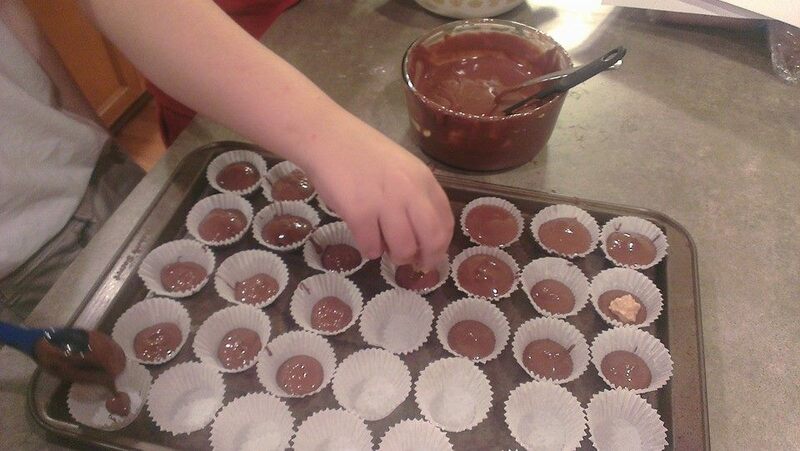 Pour a teaspoonful or so of chocolate mixture into paper liners. Top each with a teaspoonful of peanut butter mixture. We rolled it in a little ball and flattened it some then put it in the paper liner. Spoon chocolate mixture over to cover the peanut butter mixture. You could also use dark chocolate morsels if you wanted. After we had them all made I thought we should’ve added an Oreo cookie to some of them. There are so many things you can do with this simple recipe; use crunchy peanut butter, put pretzels in it, add a whole peanut to the top…you get the point. Now I’m going to peek and see if they’re ready to eat yet! UPDATE: We tore into these last night. These Homemade Peanut Butter Cups are by far better than any store bought brand. If you are one of my family members, these will be in your goodie bag this Christmas! I have a confession…I’ve always bought vanilla extract (once, when I wasn’t paying attention, I even bought imitation vanilla)! Shhh…don’t tell anyone. But not anymore! Have you ever looked at ingredients in vanilla extract? The main ingredient is alcohol! So I decided I’d make my own! It is so easy to make, the hardest part is waiting the four weeks or so before it’s actually ready to use. I used a sealable bottle (you can use a small jar). Split 2 Vanilla Beans lengthwise and scrape out the seeds. If you are using a quart or large mason jar you might need 4 or 5 vanilla beans. Put the seeds and vanilla beans in the glass container. Pour Vodka in (you might want to use a funnel if you’re filling a bottle) enough to cover the beans. Seal the container and shake. Place in a cool dark place and shake every week. The vodka will begin to darken in color over time and after about 4 weeks you will have homemade vanilla extract! I bought 2 vanilla beans at Trader Joe’s for about $3. I know I could get more for my money by ordering off the internet but I was impatient (remember, I told you all that in my “about me” section!) and I wanted them now. My extract is going on week 2. I did pop it open to smell it and it smells really good. I cannot wait to try this in something! You can also make lemon extract and other extracts this way! It’s way cheaper than buying ready made from the store and some of that store bought stuff has additives and preservatives in it. And a bonus….Once you use up the extract you can throw the vanilla beans in a bag of white sugar and make vanilla sugar out of it! I ‘d love to hear some of your tips for homemade extracts and what you use them in!